Reuben Woods reflects on Banksy and the disappearance of a prominent local public artwork. 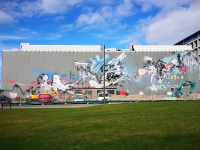 Can existing murals and urban artworks in Christchurch's central city continue to be part of the evolving local cityscape? While the world was abuzz over Banksy’s latest prank, the self-shredding Girl with a Balloon, I was reflecting on local public work by a notable urban artist that had disappeared in front of our very eyes, albeit without the gaping mouths and stares of apparent disbelief evident inside the famous Sotheby’s auction house. While Banksy’s contentious project, quickly renamed Love is in the Bin, was gaining viral status, with a swooning public response coupled with debates around its authenticity, and actual impact on the art market (Sotheby’s almost immediately claimed the work had doubled in value), in Christchurch, Anthony Lister’s massive fluttering seagull mural was being covered in grey paint in preparation for the construction of inner city apartments. Created for Oi YOU!’s Rise festival in 2013, the mural has been an iconic part of the transitional landscape. Displaying Lister’s frenetic style and employing the energy of paint-filled fire extinguishers and the careening angular ribbons of paint rollers, the seagulls swooped across the large wall, fading in and out of focus, as if coming for your fish and chips. Originally obscured by a cluster of buildings that made it difficult to view the work in totality, by the time of its demise, it had become an expansive scene, as if patiently awaiting its reveal afforded by the newly vacant foreground. It wasn’t for everyone, without an understanding of Lister’s well-honed approach, and indeed the narratives of urban art more broadly, it might have been considered haphazard, or even incomplete. For others, myself included, it was a landmark, a playful, up-scaled reflection of its surroundings, that retained a nod to urban art’s rebellious roots, and as such exemplified a successful transition to contemporary muralism. Of course, as a mural, it also had an inherent ephemerality, and as such, its disappearance should not be surprising. But, it seems the opportunity to build a layered city, evident in the likes of Owen Dippie’s obscured but still present ballerina, might offer more than whitewashing walls in preparation for development. Much like the advertising revealed by the deconstructed city, or indeed the way Banksy’s work essentially metamorphized into something new, could the murals and urban art around the city provide layers of history to integrate into the evolving landscape, rather than viewing the transitional cityscape as something to overcome, they might provide a tapestry of experience to build upon, an extension of their city-building potential? Original generation time 1.8806 seconds.